tereo Sound is an A5 sized quarterly magazine (issue No. 189, 2014 Winter, 520 pages) that has been published in Japan for over 40 years and is considered in the land of the samurai and Sony to be the final and absolute authority on audio. The language of publication is still somewhat of a challenge to me – I may know five or so Japanese words by now – yet I have read many of its reviews in their English translation. Such “cheat sheets” are released by the representatives (agents) of Japanese manufacturers. The reviews are nothing like those we know from European and American audio magazines. The main featured products are reviewed and discussed a few times in various sections of a given issue. The main presentation is a record of an in-depth discussion held in the “Stereo Sound” editorial office by all its editors and based on their auditions carried out in the editorial listening room or at home. These auditions are carried out in turns by two editors at a time, sitting one behind the other. Each product has a lead editor. The conclusions of this discussion are then detailed in subsequent product descriptions, mostly technical. “Stereo Sound” is an extreme example of an audio magazine. If you think "Stereophile" and "The Absolute Sound" to be high-end, the Japanese magazine would need to be placed in the stratosphere, as even calling it top high-end would not quite do justice to what is published there. Of course, it features relatively inexpensive components, too, but these are rare occurrences rather than the norm. And what attracts the readers are the flagship products. The more so that they have a lot to choose from, being presented with the true crème de la crème of the audio world. This is guaranteed by Japanese audio distributors who are also advertisers in the magazine. For years, one of the biggest has been Stella Inc. whose portfolio includes such premier brands as Constellation, Devialet, Einstein, Brinkmann, Vivid Audio, Tidal, Wilson Benesch, HRS, Argento and TechDAS. The last one is particularly interesting as it is a brand founded and run by Stella Inc. which, in my strong belief, has designed the best turntable in the world. Only a year ago, TechDAS was a virtually unknown name for the vast majority of non-Japanese people. Very "technical" and "angular", it was immediately linked to the name that is, in turn, known to everyone – Air Force One. The name of the U.S. president’s airplane was used to designate a turntable that was to become the "first among the first." An ambitious goal, especially given that it was the first such product from TechDAS; actually its first product ever. Every new manufacturer usually needs to pay its dues before reaching a level where skills and knowledge are complemented by experience that, combined, turn audio components into something more than a bag of electronics in a metal box. To quote Jeff Rowland, "it takes years to understand the complex relationship between component parts and the end design. Audio design is an art form that requires a lifetime to master. There are no shortcuts.” How very true, indeed. Any concerns we might have about the Air Force One, or AFO for short, are dispelled as soon as we look behind the curtain to see who is behind all this, tinkering, soldering and putting it together. The man perched over the table is Mr. Hideaki Nishikawa. Hideaki-san began his professional career in 1966 when he joined Stax to work there for the next ten years, developing electrostatic headphones. Then he designed turntable tonearms for the next few audio manufacturers that were fortunate enough to employ him. His main pride is the Black Widow, which he designed for Infinity. He eventually joined Micro-Seiki as Technical Department Manager. Soon he became the Sound Business Director, so he was the person responsible for shaping the acoustic imprint of products from this Japanese company. Summing up the 12 years he spent there, he cites the SX-8000II turntable with air bearing and vacuum hold-down system as his statement product (Ken Kessler, TechDAS Air Force One, "Hi-Fi News & Record Review", March 2013, p. 25). The Air Force One is a compilation of all the best design solutions from the SX-8000II, using the latest material processing technology and virtually unrestricted research budget. 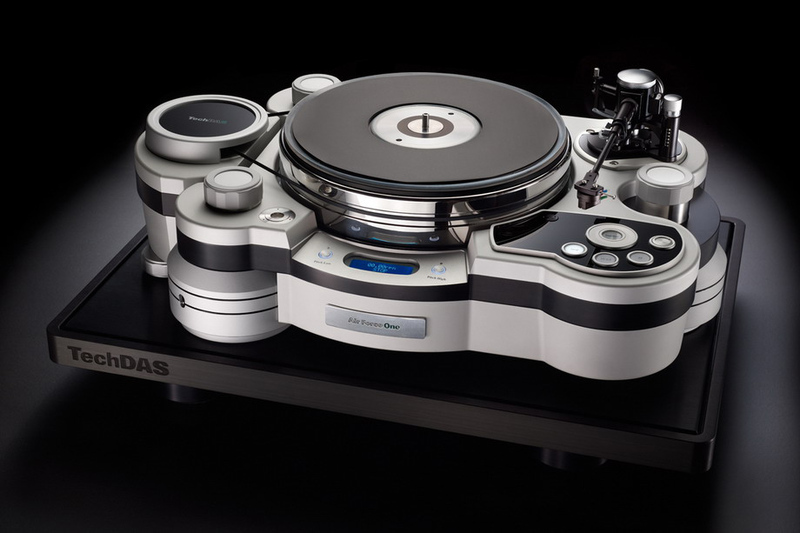 Stella owners "only" wanted him to design his best turntable ever. Micro-Seiki is a legend that has the status of a "cult" company. It has its own fan clubs and dedicated websites, such as www.micro-seiki.nl (Dutch website in English). 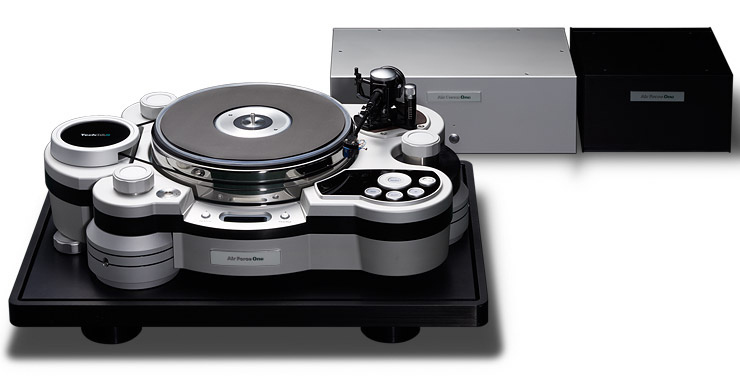 Its more expensive turntables very rarely appear on the secondary market and if they do they fetch exorbitant prices. The Air Force One is nothing but cheap, either. Looking at its design, however, it is not difficult to understand why. 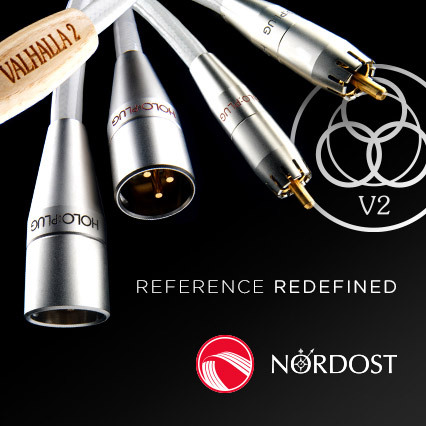 This is not another "audiophile" product that mainly appeals to us with a brand reputation (which is new here) or design solutions with difficult-to-pronounce names that are hard to find in scientific literature (because they do not exist, and their names are pure PR gimmick). Its quality is guaranteed by the authority of Mr. Nishikawa, while the solutions applied are solid hi-tech engineering. It might be argued that the above list is wishful thinking, similar to the "I would like for the world to live in peace" speeches by each Miss World, Universe or Star Empire candidate. In this case, however, chances for each of the above lines to find its happy ending were much higher than elsewhere. 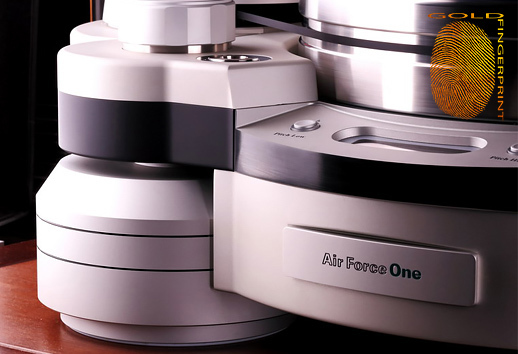 The Air Force One is a mass turntable, weighing in at 79 kg without the power supply, air pump, and air condenser unit. Its platter weighs between 21.5 kg and 29 kg (depending on the sub-platter choice), and consists of the main platter made of non-magnetic steel and an exchangeable upper sub-platter. The customer can choose the A7075 aircraft-grade duralumin which is supposed to be most neutral sonically, the SUS316L non-magnetic stainless steel for tighter bass response, or methacrylate for a softer sound. The unit that arrived for a review featured the aluminum version. The platter is suspended on a thin air film, with as little as 0.06 mm distance between the platter and the glass base surface underneath. Air cushion is the hallmark of top Micro-Seiki turntables, which found its logical development here. The air is supplied from an external pump, housed in the same chassis as the two 50-watt power supplies (separate for each phase) for the AC motor. The power supplies are controlled by a circuit sporting a microcontroller and quartz oscillator. The control circuit has been borrowed directly from the artificial heart’s power supply, which can be found in the best hospitals. The motor is housed in a very heavy chassis decoupled from the turntable base and supported by its own isolation feet. The drive is transmitted via a flat 4 mm belt made of polished non-stretchable polyurethane. To some extent, it resembles a string drive. Preparing the turntable to work requires experience and muscle. I seated the AFO on the upper shelf of my Finite Elemente Pagode Edition rack. You can also purchase a custom made anti-vibration platform from HRS (Harmonic Resolution Systems), with milled out seats for all isolation feet. HRS is a company that distributes Stella products in Japan. After setting up the base and seating the platter using clever screw-in handles, the height-adjustable feet with air suspension system need to be filled with air. Two feet are located on the left side with the motor and the third one is on the right side. Pneumatic decoupling is reminiscent of that offered by the Acoustic Revive RAF-48H air board, except that here the foot resonance is designed for the specific turntable load. Air is filled using an excellent pump - I need to buy one for my RAF air boards. The next step involves levelling the turntable and adjusting the distance from the motor unit. Only then can the belt be mounted. The latter is very important, as evidenced by a fairly long belt-calibration procedure that is part of the initial setup and needs to be repeated when changing belts. The belt-calibration process is done automatically, after pressing a button, and involves checking belt tensioning. If it is incorrect, the motor unit needs to be repositioned before repeating belt-calibration. Once the turntable communicates that it is ready, you can start listening. As I have mentioned earlier, the pump is used not only to supply air to the air bearing, but also to create vacuum under the record to hold it down to the platter. The AFO employs a "total" hold-down solution as the entire LP surface is clamped down, not just the center label area. Tapping anywhere on the black disc surface feels like tapping a stone. So we put on a disc and a record ‘clamp’ on it, press the "Suction" button, then push the desired speed button the and lower the tonearm. I put the ‘clamp’ in inverted commas as it doesn’t actually clamp anything but is used to set the resonant frequency of the main bearings. The rotational speed is reached in a rather long process. First the motor control circuit slowly accelerates the platter slightly above its normal speed before gradually slowing it down to a predetermined value. This is not really an "exhibition" turntable. Although where there’s a will there’s a way… Since I wanted to make use of the available turntable to the maximum, I came up with a rapid LP swapping system. I only pushed the Suction button, changing LPs “on the fly”. I didn’t have the slightest problem with it and the rotational speed would never change. Indications and messages are displayed on a small dot-matrix display. TechDAS has recently added a phono cartridge to its product lineup but it was not available during this review. The company does not as yet offer any tonearm, though. The turntable reviewed by "Hi-Fi News & Record Review" had been equipped with two tonearms: the Continuum Cobra with Koetsu Blue Onyx MC cartridge and the EAT E-Go with Koetsu Gold Onyx (the pictures show a different tonearm so they apparently had been provided by the distributor). Both arms had been mounted simultaneously as there is an optional second tonearm base. RCM, Polish distributor for TechDAS, offers SME arms and Dynavector cartridges. Hence, I auditioned the AFO equipped with a pair that I knew from several other turntables: the SME Series V arm with MCS150 cables (priced at 16,900 PLN) and the Dynavector DV XV-1t cartridge (29,900 PLN). Meditation – Mischa Maisky / Pavel Gililov, Deutsche Grammophon/Clearaudio LP 477 7637, 180 g LP (1990/2008). Thorens. 125th Anniversary LP, Thorens ATD 125, 3 x 180 g LP (2008). 2 Plus 1, Teatr na drodze, Polskie Nagrania Muza SX 1574, LP (1978). Bajm, Chroń mnie, Wifon LP086, LP (1986). Brendan Perry, Ark, The End Records | Cooking Vinyl | Vinyl 180 VIN180LP040, 2 x 180 g LP (2011). Clifford Brown and Max Roach, Study In Brown, EmArcy Records/Universal Music Japan UCJU-9072, 200 g LP (1955/2007). Depeche Mode, Leave in Silence, Mute Records 12 BONG 1, maxi SP (1982). Falla, The Three Cornered Hat, Decca/Esoteric ESLP-10003, “Master Sound Works. Limited Edition”, 200 g LP (1961/2008). OMD, English Electric, BMG | 100% Records 38007923, 180 g LP (2013). Orchestral Manœuvers In The Dark, Architecture & Morality, Dindisc 204 016-320, LP (1981). Skaldowie, Podróż Magiczna, Kameleon Records KAMPLP 2, “Limited edition blue wax”, 180 g LP (2013). Skaldowie, The 70s Progressive German Recordings, Kameleon Records KAMPLP 3, “Limited edition”, 180 g LP (2013). Try as I might to avoid evaluating right at the start of audition, it always ended up the same way. I would begin to describe the sound only to blurt out, halfway through my third sentence, something that clearly showed my attitude to the Air Force One turntable. I gave up fighting it once I realized that I was unnecessarily stressing. Knowing how much money you need to shell out for it, knowing its design and realizing whose "child" it is, you have the right to expect certain results and my opinion won’t change that in the least. Audio components are not created in a vacuum but result from a combination of designer’s knowledge, experience and artistic hand, financial resources, access to necessary technology and perseverance in the pursuit of the goal. And no review, even the best, will ever change that. Yet even knowing all this, one is still unprepared for what this Japanese Mechagodzilla brings. A similar thing happened to me during our group audition of the dCS Vivaldi digital system (see HERE) and, earlier, the Studer A807-0.75 VUK reel-to-reel (see HERE) that played analog master tapes. The Air Force One is the third vertex of an equilateral triangle which describes the potential of today’s audio technology. Alongside the dCS and the Studer, it is top of the tops. As I said, it could have been expected. Still, I had no idea that it would be so unsettling. For a very long time, I have not reviewed a turntable that would be so distinctive in design and offer sound that escapes classical analysis. Naturally, its sound can be described and even rated. It's just that its audition opens up new pathways in our brain that we were unaware of. Our current reference point is below it and we need to look from the top down at everything that we have heard so far. It is thus a boundary situation where I am somewhat in the dark, looking for the right adjectives and metaphors, and coming up with new ones. To say that the sound is phenomenal or outstanding is to trivialize it. Of course it is and there is not much to get excited about. What’s actually more important is HOW the sound is the best – not "to what extent" or "in which aspects", but HOW it describes the records’ sound, HOW it renders the events that took place in front of the microphones, and HOW it interprets them. For there is no doubt that it does it its own way, by a specific adaptation of the signal etched in the grooves of the vinyl disc. The AFO shows the sound better than it is in reality. No, it's not a mistake, or a slip of the tongue. I have heard something like that a few times before, but it always happened in a recording studio, while recording music in the studio or in a concert hall. Skilful microphone selection and setup, and proper mastering make it possible to create before the listener a collection of events that do not exist in reality. This is done by such adaptation of what is in front of the microphones that best conveys music presentation devoid of the visual aspect, which constitutes about 90 percent of normal human perception of the world, scaling it to the listening room dimensions that has nothing in common with the concert hall. It is an art, and that’s why the best albums can sound spectacular when played back at home, while some are nothing but rubbish. The AFO shows the music in one take. There is no time to analyze it and it’s not because a given track is somehow “rushed in” or because of its “dynamics” or “pace”, or some other descriptions that are simply worthless in this case. Actually, it’s a bit like being at a live concert. We sit down in front of the speakers or put on the headphones (in my case it’s 50/50) and do not analyze the sound but rather concentrate on musical and extra-musical aspects. At a concert, we sweep our glance across the hall searching for our friends, at the same time watching with interest other people around us. Listening to the Japanese turntable, we sweep through the music presentation, searching for similarities to what’s inside us and looking for familiar emotions, while at the same time remaining open to new experiences. Each record is a separate chapter sandwiched between the album’s beginning and end, with an interlude that occurs when flipping the record over. We can immediately tell if we like a given material or not. Our experience allows us to be bold in passing quick judgment and if it turns out not to meet the minimum level of our expectations we simply forget about it (with no hard feelings). It happened to me with a few albums I would never listen to again. Never before had the quality of music material been so clear to me. It’s true about sound quality, too, but the latter is simply not an issue of concern during this turntable auditions. We enter the world of music material like a child – without any expectations and open to new adventures. Eventually, we arrive at the form of this presentation; we are audiophiles, after all. Even then the content, that is an attempt to convey what has been recorded and processed further, stays in the first place. But it takes on a different meaning because of the way that Mr. Nishikawa’s turntable fills the gaps between the recording and the music. That is how I understand what happens when we let it do its magic. The turntable sound is incredibly deep. That’s the thing that throws us off as it can’t be compared to anything else. Even a mediocre performance (live sound), from a back seat in the audience and with substandard acoustics, allow communication with the performer. However, such event is flawed and not quite satisfying in our reception. Often simply off-putting. Only the best experiences with live instruments, in other words a top instrument and top performer in top acoustics, can give something similar to what the AFO offers with any record. Let me repeat, any record. I will come back to that later.